Click on headline for the full story. Posted on August 24th, 2006 at 11:14 am. The final chapter in the long-running saga of Mountain Cycle has now been written. Mountain Cycle was once a beloved local brand with a factory in North Portland, a presence on the local cyclocross scene and even a ‘cross bike named the Stumptown. According to a press release I just received, the new owners have decided to set up their headquarters in Seattle Washington. It’s too bad because I thought they were well on their way to doing that right here in Portland. Posted on June 29th, 2006 at 11:21 am. Following up on my post from Tuesday, I just got off the phone with Kinesis USA President Michael Chen. He called to give me more details about last week’s sale of Mountain Cycle. 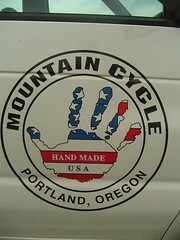 Mountain Cycle has been sold to a Taiwanese company called Ideation Industrial. 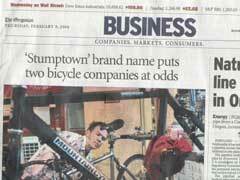 They’re a huge bicycle manufacturer established in 1977 with offices and factories across China. They sell bikes and electric scooters primarily in the European market. Posted on June 27th, 2006 at 10:20 am. I have just gotten official word from Kinesis USA President Michael Chen that Mountain Cycle has been sold. I don’t have many confirmed details yet (rumors abound), but I expect to hear more from Chen very soon. Posted on March 31st, 2006 at 1:32 pm. Michael Chen, president of Mountain Cycle and board member of parent-company Kinesis, has just released the first official statement regarding the local layoffs and shutdown of Mountain Cycle. Posted on March 20th, 2006 at 2:48 pm. Posted on March 17th, 2006 at 2:44 pm. Posted on March 8th, 2006 at 8:05 am. Posted on February 9th, 2006 at 1:22 am. Posted on January 31st, 2006 at 12:01 am. 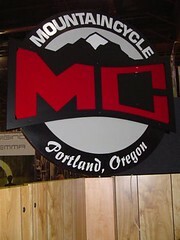 North Portland based Mountain Cycle and global bike giant Specialized Bicycle Components of Morgan Hill, California are locked in a disagreement that neither side is backing down from. 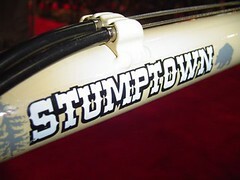 At issue is Mountain Cycle’s use of, “Stumptown” which has been the model name for their cyclocross bike since 2003.